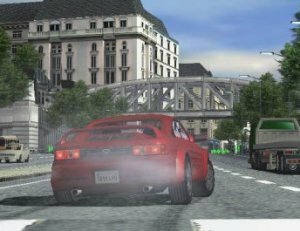 Imagine Gran Turismo 3 with panel damage and clever AI and you'll get a taste of Burnout, available now from Criterion and Acclaim. The title is a good old fashioned racing game with one of the most innovative camera systems I have yet to see in a racing title. With Burnout, crashes can be fun! The AI of the surrounding vehicles is very active and your fellow drivers respond to your driving like a maniac, attempting to swerve out of your way and if you check your rear view, even flashing their lights at you if you have a close brush with them. It's when you do have a collision that the magic truly starts. The camera and software come together and you leave your normal view of the car to cinematically witness your vehicle plowing into others in a John Woo style fashion. What's even more impressive is the way the other cars swerve to try and avoid the collision! 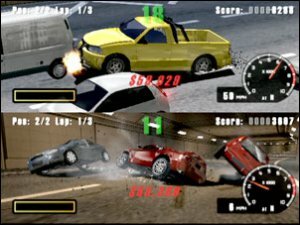 The action is fast paced and furious and Criterion are to be commended for their innovation with the crash scenes. 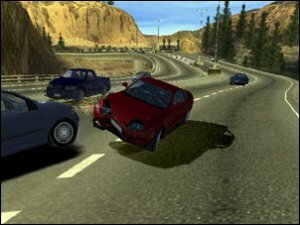 I strongly believe that this game is worth playing and there is endless replay value even if it's just a case of trying to outdo yourself on each multi-car pile-up! 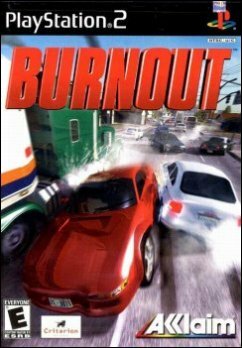 Take Burnout for a spin!